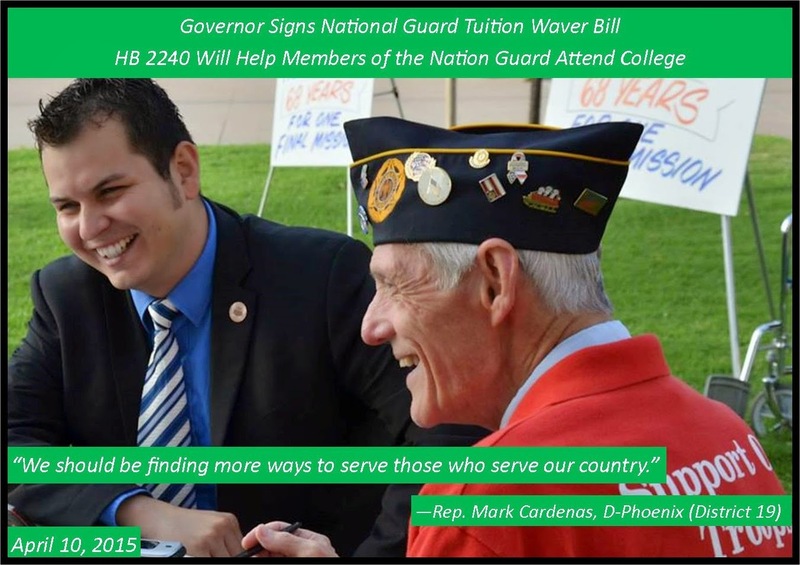 STATE CAPITOL, PHOENIX – The governor recently signed a bill Rep. Mark Cardenas, D-Phoenix (District 19), introduced that will help National Guard members cover a portion of their college tuition. HB 2240 creates a tuition waiver program for Arizona’s National Guard members who want to attend in-state, public universities. The waiver will be available beginning in 2017, provided that universities have funding available to cover the cost. To see the full text of the bill, go to http://www.azleg.gov/DocumentsForBill.asp?Bill_Number=2240&Session_Id=114&image.x=0&image.y=0.